Looking at the pictures in the link below, it appears the damage is pretty significant, with many buildings down and several people already known to have been killed. My wife is flying to Italy as we speak, so this isn't the best timing, but fortunately she'll be in the north of the country with an expat friend who knows the language and the area. I wish I'd made her take more cash, though. 2 killed the last I saw.. which is till 2 too many..
Sending thoughts your wife's way..
oh bella Italia! I noticed that in one of the before/after pictures in that article, the buildings are rubble, but the Roman aqueduct is still standing. Man, those Romans were good! modify - actually, looking at that picture again, it has columns like a modern freeway, not arches like an aqueduct, so that is probably a highway. Still a good thing that it is not in pieces, as this way relief workers can get into the area. At least 73 dead and 150 unaccounted for, with many saying the destruction appears worse than first thought. My wife made it from Philly to Venice without incident. No drama up north. Good.. Can she make a EDC just in case? It's always an uphill battle with my wife and preparedness, but I did talk her into a backpack with some essential items and a jump pack to keep her phone going. I couldn't talk her into taking the amount of cash I would have liked, though. Fortunately, the three friends she's with are all very smart, practical, and extremely capable girls she's known since 5th grade, and one of them has spent half her life in Europe, so I'm not too worried, so long as she sticks with them. I can empathize. The bright side is, when disasters and other events hit close enough to home, I can usually leverage that in small amounts. The destruction is incredible, apparently due to the fact that the quake originated from a shallow depth, and then magnified by construction techniques from the Middle Ages. One geologist said it's similar to the 5.8 quake that hit DC 5 years ago, which I was (un)lucky enough to experience first hand. I changed up my travel preparedness after that event. The quake itself wasn't that scary, but the response of the locals was pure terror, and I felt extremely vulnerable after imagining how bad it could have been. The death toll is at 120 and will likely rise even more. I don't understand why an earthquake prone region doesn't have better building standards. 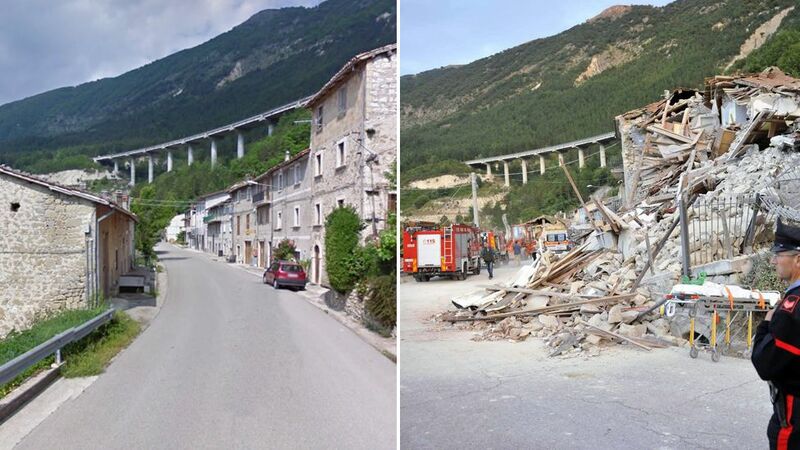 The town of Amatrice is treating victims outside because their hospital was wrecked. I can understand wanting to preserve historic buildings in quaint little towns, but hospitals and other public services need to be functional at times like this. Most of the buildings were built before there were earthquake codes in most of Italy that I've been to. Lots of native stone and mortar. Very little reinforcement with steel and wood structures are pretty uncommon in the older villages. That's what makes touring Italy an experience. It's not modern cookie cutter homes; it has character and history. Retrofitting these old structures would be nearly impossible financially. It's a risk most take without thought. A year after I moved from San Diego to Seattle, the 2001 Nisqually Quake (6. happened. Most of the damage was on roadways, where earth shifted beneath. Most of the structure damage was to the very oldest brick facades built at the turn of the 20th century. Aside from items falling off shelves, I don't recall any damage to single family homes. While it's difficult to compare earthquakes, the quake in Italy was of similar magnitude (less actually), but did FAR more structural and human damage. Unreinforced masonry is second only to mud brick for the worst material you could have in an earthquake zone. It's one of those costs of living in modern communities with building codes we take for granted. As much as I hate bureaucracy when it comes to all the added costs of building a modern home, there's no doubt that they save lives. Fire and construction codes make a huge difference in our survival from relatively minor to major disasters. I really don't begrudge California building codes, it's one of those nanny state things that actually does help me sleep better. Italy is investigating whether corrupt code enforcement contributed to the collapse of several buildings that had undergone recent seismic retrofitting. Italy is a strange place, they convicted scientists with manslaughter for failing to predict the 2009 quake.